Britain’s last-minute scramble to shape an EU exit, its biggest policy upheaval in half a century, stalled on Thursday as Prime Minister Theresa May and opposition Labour leader Jeremy Corbyn dug in their heels for competing visions. Yet there was little sign on Thursday that either of the two major parties — which hold 88 percent of the 650 seats in parliament — were prepared to compromise on key demands. Corbyn said May had sent Britain hurtling toward the cliff edge of a disorderly exit on March 29 with no transition period, and urged her to ditch “red lines”. But he repeated his own prerequisite for talks: a pledge to block a no-deal Brexit. May told Corbyn that was “an impossible condition” and urged him to join cross-party discussions. “You have always believed in the importance of dialogue in politics. Do you really believe that, as well as declining to meet for talks yourself, it is right to ask your MPs not to seek a solution with the government?,” she said in a letter. 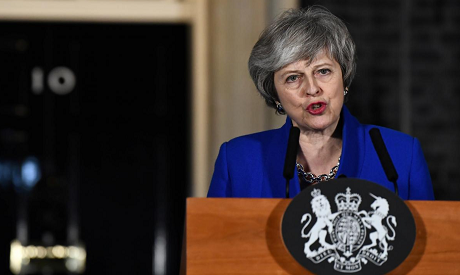 The further May moves toward softening Brexit, the more she alienates dedicated Brexit supporters in her own Conservative party who think the threat of a no-deal exit is a big bargaining chip and should anyway not be feared. May’s spokeswoman said she held “constructive” talks on Thursday with lawmakers, including some from Labour. If she fails to forge consensus, the world’s fifth-largest economy will drop out of the European Union on March 29 without a deal or will be forced to delay Brexit, possibly holding a national election or another referendum. But a second referendum would take a year to organize, according to government guidance shown to lawmakers on Wednesday, a source in May’s office said. Corbyn wants May to call another election, something she has refused, having lost her parliamentary majority in a 2017 snap poll that left her reliant on the support of a small Northern Irish pro-Brexit party. As the United Kingdom tumbles toward its biggest political and economic shift since World War Two, other EU members have offered to talk. “We will do everything we can so that Britain exits with, and not without, an agreement,” said German Foreign Minister Heiko Maas. EU chief negotiator Michel Barnier said the bloc was open to the possibility of a “more ambitious” deal than May’s, which he said could not be improved on under principles she set out. Ever since the UK voted by 52-48 percent to leave the EU, politicians have failed to agree on how or even whether to quit the bloc. If there is a solution to the riddle, it may be for parliament’s back-benchers to find it. May will on Monday put forward a motion on her proposed next steps. Over the following week, lawmakers will be able to propose alternatives. On Jan. 29, they will debate these plans, and voting on them should indicate whether any could get majority support. Labour says it would back a deal with a permanent customs union with the EU — which would resolve the problem of managing the land border between Northern Ireland and the Irish Republic — as well as a close relationship with its single market and greater protections for workers and consumers. Most Conservative lawmakers reject a customs union because it would prevent Britain having an independent trade policy — one of their main demands. Without any deal, trade with the EU would default to basic World Trade Organization rules — a worrying prospect for manufacturers dependent on smooth, uncomplicated supply lines. Company chiefs are aghast at the crisis and say it has already damaged Britain’s reputation as Europe’s pre-eminent destination for foreign investment. From Channel Tunnel operator Eurotunnel to Scottish whisky distillers, firms want decisive government action. “If anybody believes that you can just go ahead without some sort of an agreement here, I think that that is reckless,” said John Bason, finance chief of Associated British Foods (ABF.L), a food and retail group with annual sales of over $20 billion.